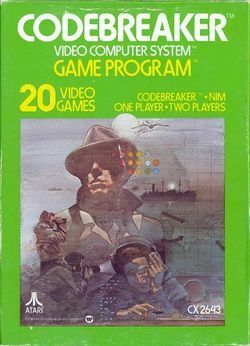 Codebreaker was one of the eleven Atari 2600 titles that were part of the second wave of games released in 1978. 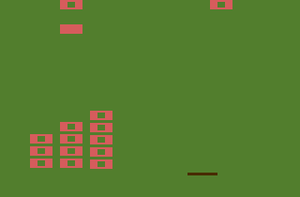 It is one of the first games to utilize the Atari Keypad controller. It essentially consists of two different games, Codebreaker and Nim. The game of Codebreaker is identical to the game more commonly referred to as Mastermind (which itself is a recreation of a much older game called "Bulls and Cows.") In this game, players must try to guess the correct combination of numbers after being told how many digits in their guess are correct, and how many of those digits are in the correct place. Nim is a far older game. The object of the game is to pick up the last object (or in some versions, to avoid picking up the last object) by systematically removing any number of objects from one particular column out of a set of available columns. Although it sounds simple in description, it can take some time to develop a proper winning strategy. Difficulty Switches: The difficulty switches do different things depending on the game being played. For the Codebreaker game, setting the difficulty switch to "a" will reduce the number of available guesses from 12 to 8. In the game of Nim, setting the difficult switch to "a" will make the computer smarter during a single player game, but will have no effect in a two player game. Game Select: Select a game variation. The variations cycle from 1 to 20 and start back over at 1. See the Game Variation section below. Game Reset: Starts a new game in whatever game variation is currently selected. All players points are reset to 0, and the state of the game is refreshed. In Codebreaker, the player can enter any sequence of numbers. Every time a number is entered, the cursor moves one space to the right to allow for another number to be entered. 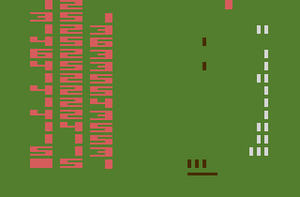 After entering the last number in the sequence, the cursor returns to the left side, allowing the player to continue refining his guess. The player can advance a column without changing the guess by pressing the "*" or "0" keys. The player can officially submit his guess for results by pressing the "#" key. If the player tries to enter a number that is invalid, a buzzing sound can be heard. In Nim, the player can select which column he or she would like to remove objects from by pressing the "*" key to cycle through all of the available columns. The player can then select how many stones he or she would like to remove by pressing the corresponding number on the keypad. That number of stones will be removed to illustrate how the move would result. The player can press "#" to officially remove the objects from the puzzle and allow the next player to take their turn. In Codebreaker, one player attempts to correctly guess the secret code with as few guesses as possible, or two players take turns trying to be the first to correctly guess the code. Once a guess is made, two indications are provided to the player to let them know how accurate their guess was. The number of dark lines indicate how many of the numbers are correct and in the correct location of the sequence. The number of light lines indicate how many numbers are correct, but are not currently in the correct location. The lines do not tell you which numbers they refer to. That must be logically deduced over the course of a series of guesses. After the number of allowed guesses have been used up, the game is over, and the correct sequence will be shown if it was not deduced. The Codebreaker game can be played in a variety of ways. Four digits increases the challenge by making it a little harder to determine which numbers are correct, and which numbers are in the right place. Allowing the sequence span to count up to 9 means three more numbers that are potentially in the solution, making it even harder to deduce which numbers are the right ones. By changing the difficulty switch from "b" to "a", you will reduce the number of guesses that you are permitted by four, making it extra challenging to guess the correct sequence in time. In a one player game, the player must simply try to guess the randomly generate sequence in as few guesses as possible. There are two different types of two player games. See the next description. In one version of the two player game, both players compete to be the first to correctly guess the randomly generated code before the other player gets it. In the other version, each player takes turns generating the sequence while the other player tries to guess it. One player can compete against the computer, or two players can challenge one another. During a single player game, the computer's intelligence can be improved by switching the difficulty switch to "a", making the computer more difficult to beat. The first four versions of Nim feature a very traditional puzzle set up, consisting of three columns, with 3, 4, and 5 objects in each column respectively. The last four versions allow a player to design the setup that gets used throughout the game. Before play begins, one player can cycle through each column using "*" and designate how many objects will reside in each column (by pressing the appropriate number key). When the player is finished designing the puzzle, press the "#" to begin playing the game against your opponent. The traditional way to play Nim, known as Nim Misère, is to force your opponent into being the one who removes the last object. However, many people prefer to play the game the other way around, where the last person who clears the game of objects is the winner. You can choose whichever version of the game you would prefer to play. This page was last edited on 7 February 2011, at 22:40.